Yesterday saw the official launch of Spanish tours of The Real Mary King’s Close, welcoming Isobel de Toledo into the characater tour guide fold! Many fascinating stories behind the historic streets are brought to life during the underground tours by several characters based on the real people who lived or frequented these once thriving homes and businesses, and they will be joined by a sixth character, Isabel de Toledo, who will conduct the tour entirely in Spanish. While existing characters are based on actual Scots who lived and worked on the Close, Isabel is based on a character of a maid to the renowned Pedro de Ayala, Spanish Ambassador to Scotland in 1500 at the court of James IV of Scotland. She would be very typical of how a maid would have lived in these times. What also sets her aside from the other character guides is that she will take guided groups around the Close speaking only in Spanish. The move comes following an increase in Spanish visitors to the Close, and it is hoped that the Spanish speaking Isabel de Toledo will add even more to the visitor experience. Nigel Hosier, the attraction’s General Manager, commented: “We pride ourselves on being an innovative attraction that listens to our customers. 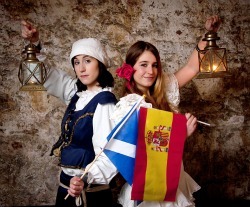 Visit Scotland’s own market research shows there has been a slight dip in domestic visitors to Edinburgh, and our own visitor research shows that we are seeing more and more Spanish visitors to The Real Mary King’s Close. By adding a Spanish speaking character it should help in describing what life was like in the 15th & 16th centuries in Edinburgh. Many Spanish visitors often lose in translation what ‘Garde Loo’ means for instance, as the Romans had taken sophisticated plumbing and sanitation techniques to Spain, and by adding a Spanish guide we hope that this should be even easier to explain”. We were delighted to welcome tourism colleagues from around the Edinburgh area, including colleagues from Visit Scotland, the STGA and from local hotels and attractions. Previous PostPrevious Stop The Plague Returning To Edinburgh! Next PostNext Don’t stress about delivery…give a Mary King’s gift voucher!